Sometimes I forget that many folks are still looking for work. Others have had to take jobs that pay less than they need. Many are working in jobs that are unappreciated and unfulfilling. 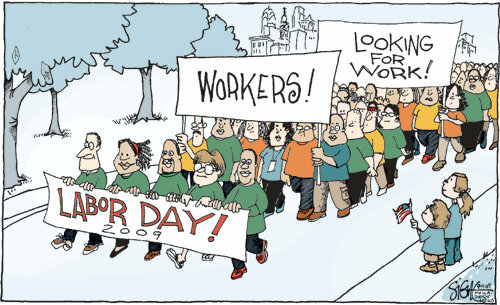 So on this Labor Day, I suggest we think about folks like these. And maybe say a prayer for them? Thanks for posting this. I never thought of it that way. I have been twice without work but never on Labour's Day. But yes, we must remember the jobless and the unfulfilled workers in prayer. May we all be gainfully employed and be blessed with meaningful work.